← King, King, Double King! I’ve occasionally come across trivia contests in which one of the questions is about the name of Dorothy’s cow. The answer is Imogene, although I’m not sure whether that’s pronounced with a short or long I. She didn’t appear in the book, of course, but did in the 1902 stage play. Basically, L. Frank Baum or one of the other people working on the show decided it would be too difficult to use a trained dog on stage, so they replaced Toto with Imogene. 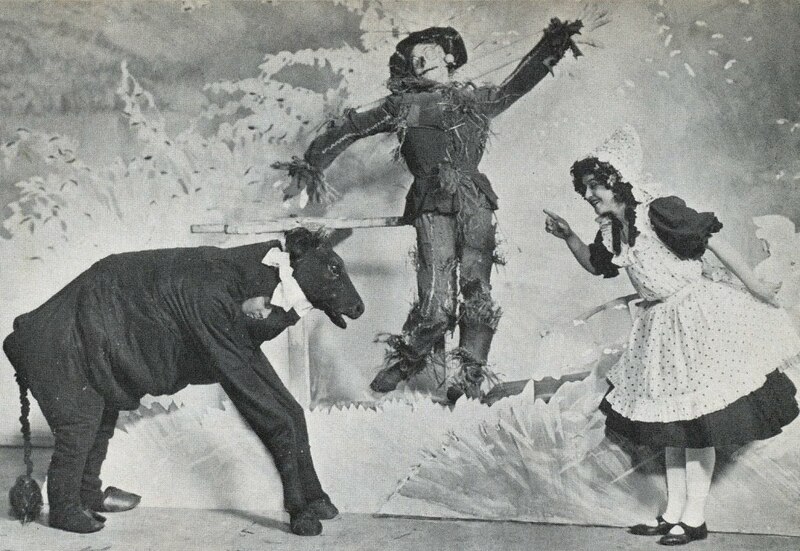 Baum seems to have had a thing for pantomime animals, not only having both the cow and the Cowardly Lion played in that fashion in the play, but also a whole bunch of animal characters in the silent films he would later make. The 1910 film of The Wizard of Oz used both Imogene AND Toto, with the latter being turned into a bulldog (or, more accurately, a guy in a bulldog suit) by Glinda. While we don’t read much else about the cow in this book, fans expanded somewhat on the bovine. Onyx Madden’s Mysterious Chronicles mentions that Mombi’s neighbor Jimb Jamb, who is Jellia‘s father, also has a four-horned cow. Madden also gives Mombi’s cow the fairly generic name of “Bossy.” And in Fred Otto’s “Mombi’s Pink Polkadot Vest,” this cow eats a forget-me-not and remembers her previous existence as a magician. Mombi transformed him into the cow, which I guess means that she was cheating in her rivalry with Jimb anyway. Cows and bulls show up in other Famous Forty books, but usually only in bit parts. Since Oz is a largely rural nation, it’s not too surprising that a good many of them would live there. In Ozma, Jinjur mentions that she’s married a man with nine cows, all of which apparently are different colors. She strongly implies that she punched her husband in the eye because he milked the red cow instead of the white one. John R. Neill’s Wonder City includes an episode featuring bulls that grew on bull-rushes in the Emerald City’s animal-plant garden. Their punnish names are Tum-bull, Fum-bull, Grum-bull, Mum-bull, Gob-bull, Hum-bull, and Trou-bull. The last of these knocks out Jenny Jump when she lands in their bullpen during a temper tantrum. Finally, in Eric Shanower’s 1993 book Giant Garden, Imogene actually shows up. This version of Imogene isn’t from Kansas, however, but rather from a dairy farm in the Munchkin Country. She has a reputation for being a bit flighty, but is still a useful companion to Dorothy on her adventure. She produces various dairy products, from chocolate milk to ice cream, depending on her mood. On very rare occasions, she can provide the golden Milk of Human Kindness, which will instantly heal anyone who drinks it. Imogene has a down-to-earth daughter named Delia, who has more control over which dairy products she will produce. I have to wonder if these cows are related to the ice cream cow kept by the King of Mo, over which Prince Zingle stages a coup. This entry was posted in Animals, Characters, Eric Shanower, Fred Otto, John R. Neill, L. Frank Baum, Onyx Madden/Jim Nitch, Oz, Oz Authors and tagged bull-rushes, bulls, cowardly lion, cows, dorothy gale, glinda, imogene, jellia jamb, jimb jamb, jinjur, mombi, mombi's pink polkadot vest, ozma of oz, prince zingle of mo, the giant garden of oz, the magical monarch of mo, the marvelous land of oz, the mysterious chronicles of oz, the wizard of oz, the wonder city of oz, toto. Bookmark the permalink.